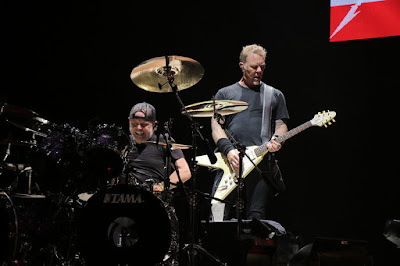 Metallica performed the Misfits classic, “Last Caress”, at Telenor Arena in Oslo, Norway on May 2, and the band are streaming professional footage from the show. Metallica covered the tune from the New Jersey band’s 1980 EP, “Beware”, on their 1987 collection, "The $5.98 EP – Garage Days Re-Revisited", which has recently been reissued after being out-of-print for decades. The 5-track set sees Metallica deliver covers of some of their primary influences, including Killing Joke, Diamond Head and Budgie. Upon its original release, the EP peaked at No. 28 on the US Billboard 200 on its way to sales of more than a million copies in the country. The Oslo show is part of Metallica’s current arena tour of Europe in support of “Hardwired…To Self-Destruct”, which the group will bring to North America this fall. "Following last summer's sold-out 25-date stadium run,” says the band, “this year we're bringing the in-the-round production currently being seen in European arenas to the U.S. and Canada kicking off on September 2, 2018 in Madison, WI.